The program allows making some changes to the rules of the “Fool” game. To do that you should enter the menu “Game” and click on “Parameters” and in the open window choose the “Rules”. This will enable you to change a number of settings. "Change the trump while rounding" – means that you may change a weaker trump for the stronger one at the beginning of the game, after the cards have been dealt. "First lead" – determines the person to lead. The “traditionally’ option means that the first to lead is the person who has the weakest trump. Once you set the “traditionally’ option you’ are given two other ones: to lead after the “fool” or before the “fool”. "Last cards of the deck" – determines the person who gets the last cards of the deck. For instance, one of the players has 4 cards, the computer has 2 cards and there are only two cards left in the deck. In case “to the one who lead” option is on, all the cards go to the one who was the first to lead. In case the “divide in halves” option is on, the cards are divided in halves irrespective of the person who lead first. "Cards in the reserve" – means that each of the players gets the same number of cards as indicated in this option. The reserve cards are laid out once the player runs out of cards and the deck is out. In case several players are playing and there are not enough cards in the deck, the number of cards in each player’s reserve is different. "Getting the dropped" – in this game in case a player can’t beat off his opponent’s card, he takes this very card together with all the cards cast off earlier. "Refusal game" – This option is only possible in case only 2 players are left in the game. The last but one leads and loses all of his cards. The last player passes the lead in spite of the fact that his opponent has got no more cards left. These cards should be taken and the game continues. 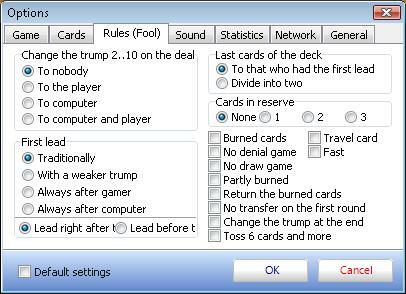 "No draw game" – means that by the end of the game in case the player beats off the computer’s last card, he loses, since his lead was the last. In case the options off, then the game ends in a draw. "Partly clear game" – means that the burned cards are cleared off the table and those which are not burned are taken by the dealer’s opponent. "Return of the burned cards" – after 1 or several cards are burned, a player can change his mind and take all of the cards. "The first round is not transferred" – means that the 1st lead cant be transferred. "Change the trump at the end of the game" – means that when there are only two cards left in the deck, the trump is changed for the last card of the deck and the game continues with a new trump. "Toss up more than 6 cards" - means that more than 6 cards can be tossed up.